The 2006 reforms were partly shaped by the recognition that although the focus must always be on the best interests of the child, many of the disputes over children following separation are driven by relationship problems rather than legal ones. These disputes are often better suited to community-based interventions that focus on how unresolved relationship issues impact on children and assist in reaching parenting agreements that meet the needs of children. The changes to the family law system followed an inquiry by the House of Representatives Standing Committee on Family and Constitutional Affairs (2003), which recommended changes to the family relationship services system and the legislation.3 The committee's report, Every Picture Tells a Story, made recommendations that aimed to make the family law system "fairer and better for children". The 2006 changes reflected some, but not all, of the recommended changes. The evaluation has involved the collection of data from some 28,000 people involved in the family law system, including parents, grandparents, family relationship services staff, clients of family relationship services, lawyers, court professionals and judicial officers and the analysis of administrative data and court files. This evaluation provides a more extensive evidence base about the use and operation of the family law system than has previously been available in Australia and is arguably more extensive than other studies that exist internationally. introduce legislative support for less adversarial court processes in children's matters (SPR Act 2006 Division 12A of Part VII). The changes to the family relationship services system included the establishment of 65 FRCs throughout Australia (designed to provide a gateway to the system for families needing assistance), funding for new services, and additional funding for existing services.7 The FRCs aim to provide assistance for families at all relationship stages, and offer impartial referrals, advice and information aimed at helping families to strengthen their relationships and deal with relationship difficulties. They also provide family dispute resolution (FDR) to separating families to assist with the development of parenting arrangements. The first fifteen FRCs commenced operation from July 2006 and 64 were operational by July 2008. The final centre opened in October 2008. Family Relationship Education and Skills Training (EDST). To what extent are the new and expanded relationship services meeting the needs of families? What help-seeking patterns are apparent among families seeking relationship support? How effective are the services in meeting the needs of their clients, from the perspective of staff and clients? To what extent does FDR assist parents to manage disputes over parenting arrangements? How are parents exercising parental responsibility, including complying with obligations of financial support? What arrangements are being made for children in separated families to spend time with each parent? Is there any evidence of change in this regard? What arrangements are being made for children in separated families to spend time with grandparents? Is there any evidence of change in this regard? To what extent are issues relating to family violence and child abuse taken into account in making arrangements regarding parenting responsibility and care time? To what extent are children's needs and interests being taken into account when these parenting arrangements are being made? How are the reforms introduced by the SPR Act 2006 working in practice? Have the reforms had any unintended consequences - positive or negative? The evaluation is based on an extensive range of studies that examine the views and experiences of parents, grandparents, family relationship service professionals and professionals from the legal and court sector. Court data and government program (administrative) data have also been used. Some of the evaluation data provide information about the operation of the family law system prior to the 2006 changes and thus provide benchmark (also termed "baseline") information against which change can be measured. The evaluation uses qualitative and quantitative methods and legal analysis. It is strengthened by the fact that the key findings are based upon data collected from multiple sources, using different methods. This provides "triangulation" for the key findings. the Families Project, which focused on the experiences of parents in general, parents who separated before and after the 2006 changes and grandparents with a grandchild whose parents had separated. Figure 1 provides an overview of the data collected during the course of the evaluation. The following section summarises the findings of each chapter in the full evaluation report. The final section in this summary report draws together the implications of these findings for the key evaluation questions. In order to evaluate the changes to the family law system, it is important to have a clear picture of the characteristics of families using the family law system, the prevalence of family violence, mental health problems and issues relating to drug and alcohol misuse and other addictions, and the quality of inter-parental relationships. While the family law system deals with families from all sectors of society, separated parents have, on average, a lower level of education and are more likely to have a preschool-aged child when they separate than parents who stay together. Around two-thirds of separated mothers and just over half of separated fathers indicated that their child's other parent had emotionally abused them before or during the separation. One in four mothers and around one in six fathers said that the other parent had hurt them physically prior to separation and, among those who reported such experiences, most indicated that their children had seen or heard some of the abuse or violence.11 When family court files (FCoA, FMC and FCoWA) were examined, over half of the files contained an allegation of family violence on the written file. Around one in five parents reported that they held safety concerns associated with ongoing contact with their child's other parent and over 90% of these parents had been either physically hurt or emotionally abused by the other parent. Half the mothers and around one-third of the fathers said that mental health problems and/or misuse of alcohol, other drugs or other addictions were issues in their family before separation. While many separated families had to deal with complex issues, it is also important not to lose sight of the fact that a majority of separated mothers (62%) and fathers (64%) had friendly or cooperative relationships with each other about 15 months after separation. About a fifth had a distant relationship and a little under a fifth had a highly conflicted or fearful relationship. EDST clients increased from about 32,000 to 49,500. The additional funding provided to early intervention services (EIS)as part of the 2006 changes was designed to prevent separation and help families build strong healthy relationships. Only a minority of partnered parents who had not experienced problems in their relationship had used relationship services to assist them in supporting their inter-parental relationship (about one in ten). However, among partnered parents who had thought that their relationship had been in serious trouble at some stage, half had used relationship or other services to attempt to address their relationship problems. Parents who used these services, along with other EIS clients, had high levels of satisfaction with the service they attended. About two-thirds of parents who separated after the 2006 changes had used family relationship services after separating. These parents were less likely than those who separated prior to the 2006 changes to have used lawyers or court process (data from Wave 1 of the Longitudinal Study of Separated Families [LSSF W1] 2008 and the Looking Back Survey [LBS] 2009). However, there was an increase post-reform in the proportion of separated and non-separated parents who thought that it was important to consult a lawyer if thinking of separating (data from the General Population of Parents Surveys [GPPS] 2006 and 2009). Services are predominantly being used by parents who had significant relationship issues. For instance, separated parents who used family relationship services were much more likely to have experienced family violence, mental health problems or drug and alcohol misuse issues than separated parents who did not use services. Separated parents who used services were also more likely to have a distant, conflictual or fearful relationship with their child's other parent. Family dispute resolution services also mainly deal with cases that involve high levels of complexity and high levels of conflict. A significant minority of cases referred to FDR involved serious family violence or the risk of abuse to the child and were judged by these service providers to be inappropriate for FDR and to qualify for an exception from FDR under s60I(9) of the SPR Act 2006. Compared with EIS clients, post-separation service (PSS) clients rated the services they attended less favourably on a number of dimensions, although FRCs and FDR services were rated favourably by the majority of clients. Of the issues examined, clients of FRCs and FDR mostly provided positive assessments of their service's provision of assistance in negotiating with the other parent post-separation. On the other hand, compared with clients of other face-to-face FRSP services, clients of FRCs and FDR services were less inclined to rate positively the ability of these services to provide them with the help they needed. This is not surprising given the complexity of issues contributing to relationship breakdown. Service professionals rated the capacity of their organisations to deliver relevant services as being generally high and overall they were confident about their capacity to work with different family types. However, language and cultural barriers were seen to be a problem by a considerable number of staff. This is likely to reflect the reality that many services are simply unable to cover the range of languages in their locations except through the use of interpreter services. On balance, the evidence is that of fewer post-separation disputes being responded to primarily via the use of legal services and more being responded to primarily via the use of family relationship services. This suggests a cultural shift whereby a greater proportion of post-separation disputes over children are being seen and responded to primarily in relationship terms. Nearly three-quarters of parents who separated after the 2006 changes had sorted parenting matters out within a year or so of separating. A substantial minority of these parents made little or no use of services such as counselling, FDR, lawyers or courts. On average, those who used services used 1.8 different types of services. Fewer than a fifth of parents said that they were "still sorting things out", and for only 10%, "nothing was sorted out". The main means of resolving parenting issues were discussions with the other parent, followed by a sense that the arrangements "just happened". This was true both for parents who separated prior to the 2006 changes and those who separated after the 2006 changes. Most parents who had reached agreements, or were in the process of reaching agreements via discussions between themselves, felt the process worked for them, for their former partners and for their children. Parents separating pre-reform were considerably more likely to have used lawyers and courts to help them resolve matters or make decisions than parents who separated after the reforms. Many separated parents did not contest parenting arrangements to any significant extent. Most parents were finding informal ways of negotiating arrangements for their children and were generally satisfied with the negotiation processes. An important finding is that half of the parents separating after July 2006 who had sorted out their parenting arrangements also reported having experienced family violence (with about twice as many reporting experiencing emotional abuse alone as those experiencing physical hurt). About three-quarters of parents who were still sorting out their parenting arrangements or for whom nothing had been sorted out had experienced violence. A third of these parents reported having been physically hurt and a little over two-fifths reported emotional abuse alone. Among both the pre-reform and post-reform samples of separated parents who sought assistance, those who used FDR services were the most satisfied with the processes they experienced, while those who went to court were the least satisfied. Generally, parents who sought help from lawyers reported satisfaction levels that were in between these two. These patterns of client ratings are likely to reflect the fact that most cases that reach the courts, and to a lesser extent lawyers, involve very difficult issues. FRSP staff generally felt that they had enough information about the family law reforms to enable them to assist clients, although EIS staff were the least confident in this regard. These same service providers generally confident about their own referral processes and protocols and frequently, although by no means universally, rated positively their capacity to work with other FRSP-funded services and a wide range of other services. At the same time, they believed that a considerable number of their clients were unclear about the requirements to attend FDR. FRAL staff were less positive about their service's capacity to work with other FRSP-funded services and referral pathways than staff working in other types of services.12 It may be that the relative isolation of such a telephone service and the comparatively brief nature of many of the calls generate a range of uncertainties about the real nature of the services "out there". The gateway function of the Family Relationship Centres is yet to become fully established. Only about half of the other service providers and only about a third of practising lawyers saw the FRCs as being an integral part the family law system. However, although many family lawyers expressed a reluctance to refer clients to services generally, many of those who made such referrals were more comfortable in referring to FRCs than to other services. FDR appears to work well for many parents and their children. Among parents who had separated after the reforms, 31% of fathers and 26% of mothers reported that they had "attempted family dispute resolution or mediation". About two-fifths of this group reached an agreement and most of these agreements were still in place at the time the LSSF W1 2008 was conducted (about a year after separation). Most parents who had not reached agreement at FDR had sorted out their dispute at the time the survey was conducted. Whether or not FDR resulted directly in an agreement, the majority of parents who had attended FDR and who had sorted out their disputes felt that they had done so mainly through discussions between themselves. This is consistent with a key aim of FDR, which is to empower disputants to take charge of their dispute. Parents who had not reached agreement at the time of FDR and who were issued with a certificate (affording them "entry" into the court system) were the least likely to have sorted matters out or to have had a decision made about their dispute. Most disputes referred to FRCs appear to be complex. Indeed, FRCs have become an early point of entry for a significant number of parents whose capacity to mediate is compromised to a greater or lesser extent by their past or present experience of violence, fear or dysfunctional behaviour. FRCs are regarded by a proportion of lawyers as the most logical entry point for effective triage and effective referral of complex cases. There is also evidence that referral of difficult cases, either to FRCs or to an FDR service, is sometimes regarded as an insurance policy. Thus, although some of the cases clearly meet the criteria for an exception under s60I(9), lawyers are not always confident that courts will see the situation this way. Such cases are frequently issued with certificates by FDR practitioners. At the same time, some parents who would probably meet the exception criteria, commence and/or complete FDR. There are no easily predictable "best" pathways for this problematic end of the dispute resolution spectrum. Some clients reported that they felt pressured into FDR or into reaching an agreement. Others with seemingly similar complex family dynamics did not provide this feedback. The new skills-based training for accrediting FDR practitioners is designed to increase capabilities in this area. The data indicate considerable overlap between client use of lawyers and client use of FDR. Clearly, the advocacy role that lawyers must play on behalf of their clients is capable of complementing or colliding with the work of an FDR practitioner. Therefore, any initiatives that promote a shared commitment to responsible FDR between lawyers and FDR professionals, and between lawyers and the service sector, is likely to improve the efficacy of FDR. FDR professionals and other service sector staff need to be actively engaged with each other if they are to avoid re-creating between themselves their own clients' high conflict and low trust. On the one hand, the data suggest continuing concerns by lawyers about FDR and the service sector in general. On the other hand, there were also many instances, most especially from regional centres, of lawyers, FDR professionals and other service professionals working cooperatively towards achieving post-separation arrangements between ex-partners that were likely to assist children to flourish. A key objective of the 2006 family law reforms was to encourage greater involvement of both separated parents in their children's lives after separation, provided that the children are protected from family violence or child abuse. "Involvement" entails such matters as: (a) taking primary care of the children, including overnight where possible; (b) contributing to decisions affecting children's general lifestyle and welfare; and (c) providing financial support. The concept of "parental involvement" thus overlaps with the exercise of "parental responsibility", although involvement may be understood as "what happens", whereas "responsibility" conveys notions of accountability or obligation. This section describes the time that parents spend with their children post-separation, Section 3.6 focuses on how care-time arrangements are negotiated and the characteristics of families with different care-time arrangements, and Section 3.7 focuses on parents' involvement in decision-making and financial support. In the evaluation, the term "shared care time" is used to refer to the situation in which a child spends 35-65% of nights with each parent (cut-offs that are consistent with those in the Child Support Scheme) and "equal care time" as the situation in which a child spends 48-52% of nights with each parent. Most parents with a child under 18 years old agreed that the continuing involvement of each parent following parental separation is beneficial for the children (81% of parents interviewed in 2009). In 2006, the proportion of parents believing that the continuing involvement of each parent following parental separation is beneficial for the children was slightly lower (77%).13 While this may reflect a small cultural shift in views towards an increased conviction about the importance of continuing parental involvement, further monitoring is required to assess whether the trends continue to hold or whether they reflect a fluctuating pattern of views. In addition, most parents in the 2009 survey believed that spending approximately half the time with each parent can be appropriate, even for children under 3 years old. The proportion of children with separated parents who experienced shared care-time arrangements increased after the July 2006 changes were introduced, as evidenced by comparisons of data collected from surveys of separated parents, the CSA and court files. The court file data suggest that the increase is especially marked among families whose dispute was finalised through judicial determination. However, the increasing prevalence of shared care-time arrangements began well before the reforms were introduced and appears to be part of an international trend. Future monitoring of trends will indicate whether the increase in shared care-time arrangements gained further momentum after the 2006 changes were fully rolled out. 11% of children aged 15-17 years. Most children spent most or all nights with their mother, with one-third spending all nights with their mother. Of the children who never stayed overnight with their father, two-thirds saw their father during the day and the other third did not see him at all. Data from the LBS 2009, which focused on parents who separated between January 2004 and June 2005, suggest that, over an interval of some 4 to 5 years after parental separation, the most durable care-time arrangement was the traditional one (where the children lived mostly or entirely with their mother). The second most durable arrangement was equal care time. A similar level of durability was apparent for shared care time involving more nights (53-65% of nights) with the mother than father and circumstances in which the child spent 66-100% of nights with the father. 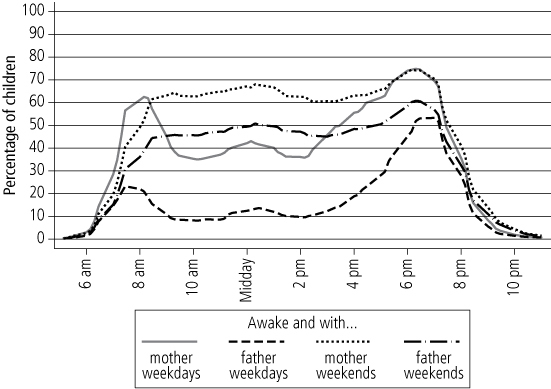 In short, traditional care-time arrangements, involving more nights with the mother than father, remained the most common and appear to be the most stable arrangement over a 4- to 5-year interval. However, shared care time is increasing both among separated families in general and among those whose dispute was litigated, especially among families whose dispute was finalised through judicial determination. Families in the LSSF W1 2008 with different care-time arrangements varied considerably across a range of circumstances. For example, there was a close link between post-separation care-time arrangements and respondents' reports about the other parent's level of involvement in the child's everyday activities prior to separation. The greater the level of pre-separation involvement, the greater, on average, the amount of care time post-separation. Families in which the father did not have the focus child stay overnight can be divided into those who had daytime-only care and those who never saw the child. The mothers and fathers with these arrangements tended to be relatively young and were the least likely of all groups to have been living with the child's other parent at the time the child was born. While there were clear socio-demographic similarities between these two groups, the distance between the two homes, the sorting out of parenting arrangements and family dynamics were quite different. Firstly, fathers who never saw their child were less likely than those with daytime-only care to live within 20 km or a 30-minute drive from the child's mother (with around one-third of the former group living at least 500 km or a 6-hour drive from her). These fathers were also more likely than those with daytime-only care to have re-partnered. Secondly, parents whose child never saw his or her father were less likely than those whose child experienced daytime-only care with the father to indicate that their parenting arrangements had been sorted out, and where arrangements had been sorted out, those whose child never saw the father were less likely to indicate that this had been achieved mainly through discussions with the other parent. They were more likely to report that the arrangements had "just happened". Thirdly, regarding family dynamics, parents whose child never saw the father reported less frequent communication with the other parent, were more likely to describe the inter-parental relationship as highly conflictual or fearful, and were less likely to view it as friendly or cooperative. Consistent with this, both the fathers and mothers in these families were more likely than those in families in which the child saw the father during the daytime only to report that they had been physically hurt by the other parent. The former group of fathers were also more likely than the fathers with daytime-only care to indicate that they had experienced emotional abuse alone. Concerns about their personal safety or the safety of their child relating to contact issues were more likely to be expressed by mothers and fathers whose child never saw the father, than by those whose child saw the father during the daytime only. Parents (especially mothers) of children who never saw their father, were also more likely than parents of children who saw the father during the daytime only to indicate that before separation there had been mental health problems, concerns about the misuse of alcohol and other drugs, and concerns about addictions such as gambling. Overall, families in which the father had daytime-only care seemed similar, in terms of these family functioning issues, to those in which the father cared for the child for a minority of nights (1-34% of nights). Those in which the child never saw the father tended to have more problematic family functioning issues than most other groups. Parents with shared care-time arrangements were as likely or more likely than parents with other care-time arrangements to believe that their parenting arrangements were working well for the child, mother and father (reported by 70-80% of parents with a shared care-time arrangement who provided assessments for all three parties). While most parents with shared care-time arrangements reported friendly or cooperative relationships, they were more inclined to report problematic family dynamics than parents in families in which the father had fewer overnight stays or daytime-only care (especially the latter group). For example, compared with families in which the father had daytime-only care, both mothers and fathers with shared care-time arrangements were more likely to report having experienced some form of family violence prior to separation. For the most part, pre-separation experiences of violence and perceived issues relating to mental health, the misuse of alcohol and other drugs or specified addictive behaviours, along with current safety concerns associated with ongoing contact with the other parent, were more commonly reported by parents whose child never saw the father or had limited or no time with the mother than by other groups of parents. Although this is consistent with the aim of the family law system to protect children's wellbeing, the other side of the coin is that there is a significant minority of children in shared care-time arrangements who have a family history entailing violence and a parent concerned about the child's safety, and who are exposed to dysfunctional behaviours and inter-parental relationships. Shared decision-making is much more likely where there is shared care time than where the child spends most or all nights with one parent. For example, 79% of fathers with equal care time (48-52% of nights) said that education decisions were shared by the parents, compared to 32% of fathers who had daytime-only contact with their child. The sharing of decision-making was also closely linked to the extent to which the father was involved in the child's day-to-day activities before separation, with higher levels of pre-separation involvement being associated with a greater tendency to report the sharing of child-related decisions post-separation. While shared decision-making represents an important means by which both separated parents can remain involved in their children's lives, its advantages are undermined where there are risks of family violence. Shared decision-making is less commonly reported by respondents who said that their child's other parent had emotionally abused them or physically hurt them (especially the latter) or who had ongoing safety concerns about contact with the other parent. Nonetheless, a substantial proportion of parents who reported a history of family violence or ongoing safety concerns indicated that decision-making was shared. For example, 37% of mothers who held safety concerns reported that education decisions were jointly made. While decision-making practices reported by parents varied considerably, legal orders concerning parental responsibility demonstrate a strong trend, pre-dating the reforms, for legal decision-making power to be allocated to both parents. There is no evidence of significant changes in the extent to which orders for shared parental responsibility are made. Orders made by judicial determination are more likely to allocate decision-making power to one or other parent (more often the mother) than those made by consent. Cases in which decision-making is removed from one parent commonly involve concerns about family violence and child abuse. Ongoing financial support for children after parental separation is another key aspect of parental involvement. More than half of parents with a child support liability reported that the liability was fully complied with (in terms of amount and time), with payers (especially fathers) being more likely than payees to indicate full compliance. Father payers and mother payees whose child lived mostly with the mother were more likely to report paying or receiving child support than those with shared care-time arrangements and those whose child was mainly with the father. However, there was no apparent link between child support payment compliance and care-time arrangements. Non-compliance in terms of payment amount or its timing seemed to be relatively uncommon, although 21% of father payees reported that child support was neither paid in full nor on time. Parents who contributed jointly to decisions about their child were more likely than other parents to indicate full compliance. Parents typically considered that their current child support payment was fair for themselves and for their child's other parent, although perceived fairness for themselves varied according to whether the parent was a payer or payee, the care-time arrangements in place, and decision-making practices. For example, a higher proportion of father payers than mother payees believed that the arrangements were personally fair, and among father payers, sense of fairness was lowest for those with equal care time, followed by those who never saw the child. Mothers whose child never saw the father were the least likely of all mother payees to report that child support payments were fair to them. In addition, parents who shared decision-making responsibilities about their child were more likely to describe their current child support payment as being fair compared with other parents. However, when interpreting the findings on perceived fairness of the Child Support Scheme, it is important to bear in mind the data were collected just after the new Child Support Formula took effect in July 2008. This was therefore a transitional period for many parents. The principle that parents should share responsibility for their children after separation had very strong support from parents, family relationship service professionals and family law system professionals. However, many of the professionals involved in the provision of relationship services or the legal sector believed that problems arise from the way in which the concept of shared parental responsibility is expressed in the legislation. The SPR Act 2006 provides that the starting point for considering post-separation parenting arrangements is the presumption of "equal shared parental responsibility" (s61DA). Where orders are made following the application of this presumption, courts "must" consider making orders (s65DAA) for children to spend "equal" or "substantial and significant time" with each parent where this is found to be in a child's best interests (s65DAA(1)(a)) and reasonably practicable (s65DAA(1)(b)). The presumption of equal shared parental responsibility is not applicable where there "are reasonable grounds to believe" there has been family violence or child abuse. Further, courts have the discretion not to apply the presumption in interim proceedings (s61DA(3)) and it is rebuttable where evidence is adduced to show its application would not be in a child's best interests (s61DA(4)). However, the paramount issue remains the best interests of the children (s60CA), meaning judges retain discretion to make orders they determine would be in a child's best interests after considering the facts of the particular case. Many professionals in the family law system say that many parents, particularly fathers, believe that the law means they are "entitled" to 50-50 "shared care" in the sense of parental responsibility and time spent. Legal sector professionals, in particular, believe that these expectations are difficult to work with and have a number of consequences, including greater disillusionment with the system among fathers who find the law does not provide for 50-50 "custody", and increased difficulty in working with parents to achieve child-focused arrangements. A majority of lawyers and family relationship service professionals indicated that it was not easy for parents to understand the difference between parental responsibility and time. They also reported that there is poor understanding among parents, and possibly some professionals, of the circumstances in which the equal shared parental responsibility presumption should not be applied or may be rebutted. Many family relationship service professionals reported that a significant proportion of parents - particularly fathers - have expectations of 50-50 care when they first attend services, but in many of the cases where such arrangements are not appropriate, parents can be assisted to develop more appropriate agreements that can meet both their child's and their own needs. They also noted that some fathers may need additional support in creating a "child-friendly" or welcoming environment for their child. However, legal system professionals16 indicated that, in some cases, expectations of a 50-50 care-time entitlement among some fathers are difficult to shift. Many legal sector professionals said that since the reforms, negotiations and litigation over parenting arrangements had become more focused on parents' rights than children's needs. A focus on the primacy of children's best interests (SPR Act 2006 s60CA) is difficult to maintain when parents are concerned with what they perceive to be their own rights under the legislation. Data from analysis of court files reveal that just over a quarter of fathers who applied to court after the reforms for orders about care time sought equal care-time arrangements. The Every Picture Tells a Story report indicated that there were perceptions in the community about an 80-20 rule in arrangements for children to spend time with their parents after separation, with mothers mostly having their child for 80% of the time.17 The evaluation data show that advice consistent with such a rule was provided by lawyers much less often after the reforms than prior to the reforms (FLS 2006 and 2009). Overall, lawyers and judicial officers said that post-reform there was more creativity evident in making care-time arrangements, with more effort being made to ensure that fathers were involved in special activities as well as their children's day-to-day routine (FLS 2006, QSLSP 2008). However, although lawyers have not changed the advice they give about the need for parents to be able to cooperate in order for a shared parenting arrangement to be of benefit to children, lawyers believe that, post-reform, more children are in shared care-time arrangements in circumstances of high conflict than before the reforms (FLS 2009). Lawyers and family relationship service providers tended to see some key aspects of the reforms differently from each other. These differences are likely to reflect a number of issues, including the different professional obligations that lawyers and service providers have, the different contexts in which they operate and differences in their respective client bases. For example, family relationship professionals were generally positive about the policy framework's ability to facilitate the making of arrangements that were developmentally appropriate for children. In contrast, a substantial majority of family lawyers said that the legal framework did not facilitate the making of arrangements that were developmentally appropriate for children. Many legal sector professionals believe the reforms have favoured fathers over mothers and parents over children, and that the post-reform bargaining dynamics are such that mothers are "on the back foot" (FLS 2008, QSLSP 2008). Some professionals in the legal sector pointed to a connection between child support liability/entitlement and a wish to increase or resist decreases in care time. Among lawyers, 68% agreed that some potential payers are trying to get more time with their children in order to reduce child support liability (FLS 2008). About a half (49%) of the lawyers who were interviewed agreed that some potential payees resist the child spending more time with the other parent in order to prevent a reduction in the amount of child support they receive. The majority of family relationship service professionals indicated that they thought child support was a motivation for no more than a quarter of their clients. While legal system professionals thought that the prevalence of this type of bargaining had increased following the 2006 family law reforms and 2008 changes to the Child Support Scheme, further work is needed to determine whether the prevalence has actually increased and if so to what extent. Another issue identified by lawyers as being relevant to the positions some parents adopt in negotiating parenting arrangements relates to post-separation property division. Some lawyers maintained that some fathers were motivated to seek equal care-time arrangements in order to maximise their share of the post-separation property division (FLS 2008, QSLSP 2008). Overall, the data from the Family Lawyers Survey 2008 suggest there may have been a decrease in the average share of property allocated to mothers in post-separation property settlements after the reforms, with varying estimates of the shift varying, but with most being in the region of a five per cent decrease (e.g., from a 70-30 split in favour of mothers pre-reform to perhaps a 65-35 split in favour of mothers post-reform). The evaluation provides clear evidence that the family law system has some way to go in being able to respond effectively to family violence and child abuse. It also provides evidence of the 2006 changes having improved, in some areas, the way in which the system identifies families where there are concerns about family violence and child abuse. Specifically, there is evidence in the family relationship service sector and some parts of the legal sector that attempts to identify such families have become more systematic since the 2006 changes. It is important to recognise that family relationship and legal sector professionals expressed a range of views about how well the system is working. It is also important to keep in mind when interpreting the evaluation findings about family violence that this is probably the most difficult area for any family law system to address. Many of the issues identified in the evaluation existed prior to the reforms. The legislative changes introduced as part of the reforms placed greater emphasis on the need to protect children from harm and from exposure to family violence and child abuse (SPR Act s60B(1)(b), s60CC(2)(b)). Two other key aspects of the legislation that address these issues are: the exception to the requirement for parents to attend FDR where there is a risk of family violence (s60I(9)); and reasonable grounds to believe that there has been family violence by a parent being a reason for the non-application of the presumption of equal shared parental responsibility (s61DA(2)). As indicated above, systematic screening processes are in place across the family relationship services sector to identify matters involving family violence and child abuse, although screening occurs less systematically in the legal sector. The FCoA and the FCoWA screen routinely, but the FMC does not (although parties have the opportunity to draw safety concerns to the attention of court staff). Lawyers and professionals who work in the relationship services sector indicated that concerns about family violence and child abuse and neglect are common among separating families. However, lawyers and relationship service professionals both expressed much greater confidence in the ability of the family law system to ensure that children had meaningful involvement with each parent than in its ability to ensure that children are protected from harm, family violence, child abuse and neglect. Where at least one parent holds safety concerns (for themselves or their child) as a result of ongoing contact, parenting arrangements take longer than otherwise to resolve and entail the use of a greater number of different types of services. For instance, 48% of mothers and 55% of fathers who held safety concerns contacted at least three services, compared with 16% of fathers and 20% of mothers without such concerns (LSSF W1 2008). Between 16% and 20% of parents with a shared care-time arrangement held safety concerns associated with ongoing contact with the other parent. The prevalence of safety concerns among these parents, however, was similar to that apparent among parents whose child spent most nights with the mother and among parents whose child saw the father during the daytime only. Between a fifth and a quarter of parents who participated in the Survey of FRSP Clients 2009 reported experiencing fear of the other party when they were using the relationship service. Of these parents, around 35% (depending on the service attended) indicated that these concerns or fears were not addressed at the time of attending the service. Relationship service providers had high levels of confidence in their ability to identify and work with families experiencing family violence and child abuse. While the majority of clients thought that the service adequately dealt with their fear or safety concerns relating to the person about whom they attended the service, around one-third said that the service did not adequately respond. Relationship service sector practice often means engaging with such families in ways that will ensure that safety concerns are also addressed via liaison with or referrals to other services specialising in areas such as mental health, addictions and family violence. These interventions can be in some tension with the perceived need to develop comprehensive parenting arrangements as a matter of priority. Family relationship sector staff spoke of assisting with "holding" arrangements for parents and children while some dysfunctional behaviours and attitudes were addressed. Lawyers were largely confident in their own ability to screen for family violence and child abuse and neglect, but less confident (and largely unfamiliar with) the service sector's ability to do so. Both lawyers and service professionals expressed reservations about the adequacy of the family law system's response when concerns about family violence and child abuse are raised. Close to half the lawyers in the Family Lawyers Survey 2008 expressed the view that the legal system had not been able to adequately screen for family violence and child abuse. A range of complex issues underlie the concerns that system professionals held about a lack of efficacy in handling family violence and child abuse and neglect across the system. Relevant issues include a lack of understanding of family violence and child abuse in various parts of the system and perceptions of there being pressure to reach agreements notwithstanding the presence of such concerns. Problems also stem from the intersection of the state and federal legal systems, and with lawyers (and family relationship sector professionals) finding child protection systems difficult to engage with when there are concerns about risks to children. These issues pre-date the reforms and are longstanding. Further, some professionals believed that some new aspects of the legislative framework have discouraged concerns about family violence and child abuse from being raised. These include an obligation of courts to make costs orders against a party found to have "knowingly made a false allegation or statement in proceedings" (SPR Act 2006 s117AB) and the requirement for courts to consider the extent to which one parent has facilitated the child having a relationship with the other parent (s60CC(3)(c)). While there was widespread concern that family violence and child abuse and neglect are being inadequately responded to, some legal professionals and fathers also claimed that allegations about family violence and child abuse were being used to impede fathers' claims for a shared parenting role after separation. The move to encourage each parent to spend equal or substantial time with their child is based, at least in part, upon the view that there is benefit to many children from having a meaningful relationship with both of their parents and that substantial time with both parents can assist in this being achieved. However, the legislation also recognises that children need to be protected from harm and from exposure to abuse and family violence. To what extent do children benefit from "equal" or "substantial and significant" time with each parent? There is strong evidence that the quality of children's relationships with their parents is important to child outcomes. Exposure to inter-parental relationships characterised by high levels of acrimonious conflict, or by fear, safety concerns or physical harm clearly jeopardise children's wellbeing. However, while the development and maintenance of a close relationship requires spending time together (typically through face-to-face interaction), the existing literature suggests that "more time" does not necessarily equate with better outcomes for children. Concerns have been raised as to whether shared care-time arrangements exacerbate any negative impacts of parental separation on children's wellbeing if their parents are locked in a high level of conflict or have a history of violence. Concerns have also been raised about whether substantial (shared) care-time arrangements are detrimental to the developmental needs of very young children. the existence of violence pre-separation. The analysis was primarily based on data from the LSSF W1 2008 and was supplemented by data from the first three waves of the Longitudinal Study of Australian Children (LSAC). While the LSSF W1 2008 has the advantage of providing a large sample of children and their families, its main limitation is that information on child wellbeing is entirely based on parents' reports. The LSAC survey, on the other hand, is based on a much smaller number of children whose parents have separated, but information on child wellbeing is derived from parents, teachers and the children themselves. Regression modelling was used to estimate the impact of different care-time arrangements on the wellbeing of children, while taking into account (i.e., holding constant) the impact of other variables likely to affect children's wellbeing (e.g., parental educational attainment, labour force status, and country of birth). The regression modelling framework was used to estimate whether the impact of different care-time arrangements depends upon: (a) the quality of the parental relationship post-separation; and (b) whether there is a history of violence. Analysis of both the LSSF W1 2008 data and LSAC studies suggest that, compared to the outcomes of those who spent 1-34% of nights with their father or had daytime-only care with the father, children's outcomes were similar (or perhaps marginally better) in shared care-time arrangements, while children who never saw their father appeared to fare worse. While a history of family violence and highly conflictual inter-parental relationships appear to be quite damaging for children, there was no evidence to suggest that this negative effect is any greater for children with shared care time than for children with other care-time arrangements. It remains possible, however, that the measures adopted in this analysis were insufficiently sensitive to detect existing effects in these areas.18 Longitudinal research based on a relatively small clinical sample of high-conflict separating families (McIntosh, 2009) found that, compared to other parenting arrangements, a pattern of shared care sustained over more than 12 months was associated with a greater increase in the already negative impact on children of highly conflictual inter-parental relationships and the negative impact of circumstances in which one parent holds concerns about the child's safety. When the measure of family violence is whether the mother expressed safety concerns, analysis of the LSSF W1 2008 reveals that shared care time exacerbates the negative impacts on children. Where this situation existed, children in shared care-time arrangements fared worse, according to mothers' assessments, than those who stayed with their father for only 1-34% of nights. The presence of safety concerns was associated with lower child wellbeing in all care-time arrangements. These findings are consistent with the findings of other researchers. Most separated parents in 2006 thought that the relationship between their own parents and their children was close or very close, but non-resident fathers were least likely to think this. In addition, non-resident fathers in 2009 were the least likely to rate their own parents as being very involved or quite involved in their children's lives. Maternal grandparents whose grandchild lived mostly with the mother were the most likely to report close or very close relationships with their grandchild and to indicate that they spent time with their grandchild at least once a week, while paternal grandparents whose child lived mostly with the mother were the least likely to report such circumstances. A similar pattern was evident when parents were asked about the child-grandchild relationship. Reports of parents and grandparents also suggested that such trends at least partly resulted from the impact of children's care-time arrangements after parental separation. For example, non-resident fathers and paternal grandparents whose grandchild lived with the mother were the most likely of the groups examined to indicate that relationships had become more distant as a result of separation. Only a minority of grandparents made use of services in relation to the separation and, where services were used, lawyers and legal services were used considerably more often than any other source of formal assistance. Paternal grandparents were considerably more likely to seek the support of services than maternal grandparents. Few grandparents in the focus groups had knowledge or understanding of the range of services available. Interviews and surveys with FRSP staff revealed a growing appreciation of the importance of including grandparents in the negotiations and discussions, where appropriate. Many lawyers, too, indicated they had advised grandparents who sought advice about contact with grandchildren that they were in a stronger position under the new legislation (FLS 2008). There was also an appreciation by FRSP staff of the complexity of some extended family situations, and the need to avoid automatically assuming that involvement of grandparents would contribute positively to the children's lives. The stories from the grandparents' focus groups reflected this complexity. In summary, the overall picture is of grandparents being very important in the lives of many children and their families, with some evidence that the legislation has contributed to foregrounding this. Clearly, grandparents can also be an important resource when families are struggling during separation and at other times. But as complexities increase in particular families, dispute resolution and decision-making in cases involving grandparents are likely to prove difficult and time-consuming. Three main courts exercise jurisdiction in disputes involving separated families. Only one state, Western Australia, has its own state-based court, the Family Court of Western Australia. The other states and territories are served by the Family Court of Australia, established in 1976, and the Federal Magistrates Court, which began operating in 2000. The FCoA and FMC operate in parallel, although the FCoA is a specialist family law court and the FMC also exercises jurisdiction in a range of federal law areas. The more "complex" family law work is meant to be handled by the FCoA, but it is evident that both courts handle a high number of matters involving family violence and/or child abuse and a range of dysfunctional behaviours. More allegations concerning child abuse are made in the FCoA, though such allegations are still prevalent in FMC matters. While the number of applications for final orders relating to children's matters that were made to the FMC between 2005-06 and 2008-09 increased, this increase was more than offset by the decrease in the total number of such orders that were lodged across the system. Specifically, the overall number of such applications declined by 22% from 18,752 in 2005-06 to 14,549 in 2008-09 (Figure 2). The number of applications to the FCoA declined by 72% from 7,479 to 2,086 over this period and the number to the FMC increased by 17% from 9,405 in 2005-06 to 10,987 in 2008-09 and the number of applications to the FCoWA decreased by 21% from 1,868 to 1,476. Note: Includes children only and children plus property matters. It should also be noted, however, that applications for final property orders increased post-reform, reversing a pre-reform trend towards stability. Further investigation is required to determine whether there is a causal connection between these trends and the 2006 family law system changes. In the post-reform period, a pre-existing trend for more matters to be filed in the FMC and fewer in the FCoA gained momentum, with filings in the FMC in all relevant categories (children only, children and property, property only) increasing as FCoA filings decreased. While there is a range of reasons for the change in filing patterns between the courts, it mainly appears to be linked to changes in the allocation of resources (i.e., judicial officers) between the two courts, with the number of federal magistrates increasing and the number of FCoA judges decreasing. In each court, the number of Form 4 notices21 that were filed increased as a proportion of filings. In the FCoA, the proportion of matters where Form 4 notices were filed increased from 9% in 2004-05 to 21% in 2008-09. 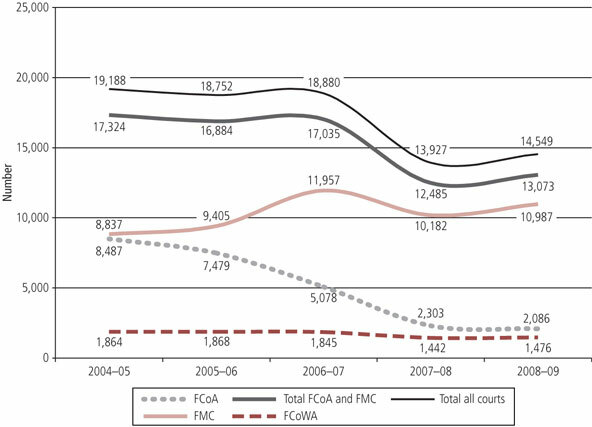 In the FMC, filings of Form 4 notices increased from 4% of matters in 2004-05 to 8% in 2008-09 and in the FCoWA increased from 11% of matters in 2004-05 to 23% in 2008-09. In the post-reform period, the proportion of matters where an order for an independent children's lawyer (ICL) was made also increased in both the FMC and FCoA (FCoWA data were not available). For example, in 2004-05, about 19% of FMC and FCoA matters had such orders made, compared with 33% in the FCoA and 34% in the FMC in 2008-09. Legal system professionals who participated in the QSLSP 2008 and the FLS 2008 raised a number of concerns about the parallel operation of the FMC and FCoA. These included the implications for parents and practitioners of there being two courts administering the same legislation on the basis of two very different sets of processes. One issue stemming from this was that the FMC provided practitioners who preferred to operate in a traditional adversarial model with a forum in which to do this. This issue has particular significance when it is considered that some 84% of children's matters were dealt with in the FMC in the post-reform period in states and territories other than Western Australia. The FMC was valued for its quicker, cheaper service, and it was acknowledged that there were excellent federal magistrates. However, there were also concerns about the time pressures under which federal magistrates operate, their heavy caseload and the fact that some federal magistrates did not have a family law practice background. There were also concerns expressed by family consultants, judicial officers and lawyers about the role played by family reports (provided by social workers or psychologists) in bringing about settlements of parenting matters in the FMC. These concerns arise from the fact that some parenting disputes in the FMC are being settled on the basis of family reports, which are not examined through legal processes. This means that factual issues, such as allegations of family violence and child abuse, are not tested in court. This is not necessarily relevant in all cases, but it was a concern commonly expressed. Some federal magistrates were perceived to be more inclined to adopt a literal interpretation of the SPR Act 2006, meaning that some outcomes may not have sufficiently taken into account the needs of children, particularly those in younger age groups. There was also concern that time pressures inhibited the effective scrutiny of allegations of family violence and child abuse. The quantitative data from the studies of FCoA, FMC and FCoWA court files post-1 July 2006 court files indicate some variation in patterns of outcomes between the three courts, although perhaps not as large as suggested by some professionals in the qualitative study. It is important to note, though, that in formulating advice for clients, lawyers are trained to look at the range of possible outcomes suggested by decisions handed down in matters that may have similar fact situations. This training means that they tend to be particularly attuned to differences in approach between decision-makers and this will influence the advice they give clients and their views as to how the law is being applied. Transfers were also seen to be a difficulty, with federal magistrates seen as being reluctant to transfer matters to the FCoA, even those involving family violence and child abuse. As a result of the different case management systems operating in the three courts, matters in the FCoA and the FCoWA are subject to routine screening for family violence, child abuse and other complex issues, but those filed in the FMC are not. One of the aims of the 2006 reform package was to ensure that matters that proceeded to court were resolved in a more child-focused way. To this end, Division 12A of Part VII was introduced, outlining a series of "Principles for conducting child-related proceedings". These principles were based on some aspects of a new case management system the FCoA had piloted, prior to the reforms, in its Children's Cases Program (Harrison, 2007). This approach was intended to reduce adversarialism and increase the child focus in child-related matters. Both the FCoA and the FCoWA changed their case management approaches to support the introduction of Division 12A of Part VII. The models differ in some respects, but both involve family consultants having initial contact with the families to allow early assessment of the issues and to conduct screening. The FMC did not have the family consultant resources to change its model, although its approach of active judicial management is seen as being consistent in some aspects with Division 12A of Part VII. The evaluation considered the FCoA, FCoWA and FMC processes as part of a much larger set of questions concerning the impact of the reforms and, for this reason, the insights provided by the evaluation should be considered to be exploratory. the proceedings are to be conducted without undue delay and with as little formality and legal technicality as possible (s69ZN(7)). giving directions and making orders regarding procedural steps (s69ZQ(1)(c)), subject to deciding whether a step is justified on the basis of likely benefits considered against the cost of taking it (s69ZQ(1)(d)). make an order in relation to an issue arising out of the proceedings (s69ZR(1)(c)). A majority of legal system professionals (who participated in the QSLSP 2008 and the FLS 2008) supported the child-focused principles inherent in Division 12A of Part VII and many of these participants expressed concerns about its lack of availability in areas not serviced by the FCoA. While family consultants and judges mostly viewed Division 12A of Part VII (and the case management models that accompanied it in the FCoA and the FCoWA) as a positive step, lawyers were more cautious. Judges welcomed the increased flexibility in powers to decide which issues should be determined, at what stage of proceedings they should be determined and what evidence should be filed. Family consultants indicated the process had improved child focus. Data from the FLS 2006 and 2008 indicate that 58% of family lawyers agreed in 2008 that Division 12A was a desirable change, compared with 60% in 2006. A consistent and substantial minority (29% in both years) disagreed that the change was desirable. Divided views were evident in relation to other aspects of Division 12A as well, with 40% of lawyers in 2008 agreeing that it produced better outcomes for children, compared with 34% disagreeing. Similarly, 43% of lawyers in 2008 agreed that Division 12A processes allowed sufficient flexibility to deal with family violence and child abuse, compared with 37% disagreeing. Lawyers raised a range of concerns about Division 12A of Part VII as it had been implemented in the FCoA, including concerns about more court events leading to increased costs, more delays, inconsistent judicial approaches to the exercise of powers22 and the disadvantages of having inarticulate or uneducated clients speaking to the judge. Similar concerns were expressed in relation to the FCoWA model, but these were not as numerous or substantial. In relation to both the FCoA and the FCoWA models, some lawyers indicated that the process benefited clients by allowing them an opportunity to speak directly to the judge and thus to feel heard. Lawyers also valued the social science input of family consultants in the FCoA and FCoWA models. The amendments to Part VII of the FLA made by the SPR Act 2006 (Cth) are seen to have produced a legislative pathway that is complex and convoluted and not easily understandable by parents and some system professionals. Judges who participated in the QSLSP 2008 indicated that judgments were taking longer to write because of the increased number of provisions to consider. Lawyers said advice-giving is more difficult and time-consuming, with parents finding the law difficult to comprehend, and cases taking longer to prepare. The legislative pathway that must be followed in making decisions requires judicial officers to apply numerous provisions (including s60CC(2), s60CC(3), s60DA, s65DAA) to the facts and this complexity is considered by many professionals to obscure the primacy of the "best interests" (s60CA) principle, particularly in arrangements made by negotiation. The application of the presumption in interim hearings on the basis of little evidence was also seen as problematic. A key post-reform judgment, which outlines an 11-step process to be followed in applying the legislation (Goode and Goode (2006) FamCA 1346), even on an interim basis, underlines the complexity in applying the legislation. While court-based decisions demonstrate a variety of approaches to parental responsibility and time orders, reflecting case-by-case decision-making on the basis of the best interests principle (SPR Act 2006 s60CA), community understandings of the law as providing for "50-50" outcomes on the basis of the presumption highlight the confusion engendered by some aspects of changes to the parenting provisions. This evaluation has shown that a significant proportion of families who actively engage with the family law system have complex needs and are affected by issues such as family violence, child abuse, mental health problems and substance misuse. Such families are the predominant clients both of post-separation services and the legal sector. 1. To what extent are the new and expanded relationship services meeting the needs of families? (a) What help-seeking patterns are apparent among families seeking relationship support? (b) How effective are the services in meeting the needs of their clients, from the perspective of staff and clients? There is evidence of fewer post-separation disputes being responded to primarily via the use of legal services and more being responded to primarily via the use of family relationship services. This suggests a cultural shift whereby a greater proportion of post-separation disputes over children are being seen and responded to primarily in relationship terms. About half of the parents in non-separated families who had serious relationship problems used early intervention services to assist in resolving those problems. There was less use of these services to support relationships by couples who had not faced serious problems (about 10%). Client satisfaction with early intervention services was high, with a large majority of clients being willing to recommend the services to others. Overall, clients of post-separation services also provided favourable ratings. Over 70% of FRC and FDR clients said that the service treated everyone fairly (i.e., practitioners did not take sides) and over half said that the services provided them with the help they needed. This rate can be considered to be quite high, given the strong emotions, high levels of conflict and lack of easy solutions that these matters often entail. Family relationship service professionals generally rated their capacity to assist clients as high. They also spoke of considerable challenges linked to the complexity of many of the cases they are dealing with and of waiting times linked largely to resourcing and recruitment issues, especially in some of the FRCs. Consistent with an important aim of the reforms, family relationship service professionals generally placed considerable emphasis on referrals to appropriate services. At the same time, ensuring that families are able to access the right services at the right time represents one important area where there is a need for ongoing improvement. Pathways through the system need to be more clearly defined and more widely understood. There is still evidence that some families with family violence and/or child abuse issues are on a roundabout between relationship services, lawyers, courts and state-based child protection and family violence systems. While complex issues may take longer to resolve, resolutions that are delayed by unclear pathways or lack of adequate coordination between services, lawyers and courts have adverse implications for the wellbeing of children and other family members. There is a need for more proactive engagement and coordination between family relationship service professionals and family lawyers and between family law system professionals and the courts. This need is especially important when dealing with complex cases. 2. To what extent does FDR assist parents to manage disputes over parenting arrangements? The use of FDR post-reform was broadly meeting the objectives of requiring parents to attempt to resolve their disputes with the help of non-court dispute resolution processes and services. About two-fifths of parents who used FDR reached agreement and did not proceed to court. Almost a third did not reach agreement and did not have a certificate issued. However, most of these parents reported going on to sort things out mainly via discussions between themselves. About a fifth were given certificates from a registered family dispute practitioner that permitted them to access the court system. Most of these parents mainly used courts and lawyers and most had not resolved matters or had decisions made approximately a year after separation. Family Relationship Centres have also become a first point of contact for a significant number of parents whose capacity to mediate is severely compromised by fear and abuse, and there is evidence that FDR is occurring in some of these cases. This may reflect an inadequate understanding of the exceptions to FDR (SPR Act 2006 s60I(9)) by those making referrals. At the same time, the complexities of this process need to be acknowledged. There are decisions that need to be made on a case-by-case basis, including decisions about who is best placed to make a judgment concerning whether there are grounds for an exception and the extent to which professionals should respect the wishes of those who qualify as an "exception" but opt nonetheless for FDR. Clearer inter-professional communication (between FDR professionals, lawyers and courts) will not provide prescriptive answers to such questions but would assist in developing strategies to ensure that there is a more effective process of sifting out matters that should proceed as quickly as possible into the court system. Progress on this front, however, also requires earlier access to courts and greater confidence on the part of lawyers and service professionals that clients will not get "lost in the family law system". 3. How are parents exercising parental responsibility, including complying with obligations of financial support? In lay terms, parental responsibility has a number of dimensions, including care time, decision-making about issues affecting the child, and financial support for the child. Shared decision-making is most likely to occur where there is shared care time. Shared decision-making was much less common among parents who reported a history of family violence or had ongoing safety concerns for their children. Nonetheless, the exercise of shared decision-making was reported by a substantial proportion of parents with a history of violence. In contrast to the systematic variation in decision-making practices reported by parents with different care-time arrangements, legal orders concerning parental responsibility demonstrated a strong trend, pre-dating the reforms, for decision-making power to be allocated to both parents. There is evidence of some increase in shared responsibility outcomes for cases that went to court following the 2006 changes. Conversely, there were only relatively small decreases in the proportion of cases in which the mother or the father had sole parental responsibility. Generally, fathers' compliance with their child support liability did not vary according to care-time arrangements (the only exception is that fathers who never saw their child were less likely to comply with their child support obligations). Father payers with equal care time and fathers who never saw their child were more inclined to believe that child support payments were unfair, compared to father payers with other care-time arrangements. Child support compliance was higher where there was shared decision-making than where one parent had all of the decision-making responsibilities. 4. What arrangements are being made for children in separated families to spend time with each parent? Is there any evidence of change in this regard? Although only a minority of children had shared care time, the proportion of children with these arrangements has increased. This is part of a longer term trend in Australia and internationally. Judicially determined orders for shared care time increased post-reform, as did shared care time in consent cases. The majority of parents with shared care-time arrangements thought that the parenting arrangements were working well both for parents and the child. While, on average, parents with shared care time had better quality inter-parental relationships, violence and dysfunctional behaviours were present for some. Generally, shared care time did not appear to have a negative impact on the wellbeing of children. Irrespective of care-time arrangements, mothers and fathers who expressed safety concerns described their child's wellbeing less favourably than those who did not hold such concerns. However, the reports of mothers suggest that the negative impact of safety concerns on children's wellbeing is exacerbated where they experience shared care-time arrangements. 5. What arrangements are being made for children in separated families to spend time with grandparents? Is there any evidence of change in this regard? Just over half the parents who separated after the 2006 changes to the family law system felt that time with grandparents had been taken into account when developing parenting arrangements, and just over half the grandparents confirmed this view. Parents who separated prior to the 2006 changes to the family law system were less likely to recall having taken into account grandparents when developing parenting arrangements. Nevertheless, the reports of both parents and grandparents suggest that relationships between children and their paternal grandparents often become more distant when the child lives mostly with the mother (reflecting the most common care-time arrangement). The parents in most families in these studies would have separated before the reforms were introduced. The level of impact of the reforms on the evolution of grandparent-grandchild relationships is an important area for future research. There appeared to be a growing awareness among both family relationship service staff and family lawyers of the potential value and importance to children of taking into account grandparents when developing parenting arrangements. While grandparents were seen, in most cases, to have the potential to contribute much to the wellbeing of children, there was also an appreciation by family relationship service professionals of the complexity of many extended family situations. This was associated with a recognition that, in some cases, too great a focus on grandparents when developing parenting arrangements might be counter-productive. The overall picture, however, is of grandparents being very important in the lives of many children and their families, with some evidence that the legislation has contributed to highlighting this. Clearly, grandparents can also be an important resource when families are struggling during separation and at other times. But as complexities increase, dispute resolution and decision-making in cases involving grandparents are likely to prove to be more difficult and time-consuming. 6. To what extent are issues relating to family violence and child abuse taken into account in making arrangements regarding parenting responsibility and care time? For a substantial proportion of separated parents, issues relating to violence, safety concerns, mental health, and alcohol and drug misuse are relevant. The evaluation provides evidence that the family law system has some way to go in being able to respond effectively to these issues. However, there is also evidence of the 2006 changes having improved the way in which the system is identifying families where there are concerns about family violence and child abuse. In particular, systematic attempts to screen such families in the family relationship service sector and in some parts of the legal sector appear to have improved identification of such issues. Families where violence had occurred, however, were no less likely to have shared care-time arrangements than those where violence had not occurred. Similarly, families where safety concerns were reported were no less likely to have shared care-time arrangements than families without safety concerns (16-20% of families with shared care time had safety concerns). Safety concerns were also evident in similar proportions of families with arrangements involving children spending most nights with the mothers and having daytime-only contact with the father. The pathways to these arrangements included decisions made without the use of services and decisions made with the assistance of family relationship services, lawyers and courts. Mothers and fathers who reported safety concerns tended to provide less favourable evaluations of their child's wellbeing compared with other parents. This was apparent for parents with all care-time arrangements, including the most common arrangement where the child lives mainly with mother. But the poorer reported outcomes for children whose mothers expressed safety concerns were considerably more marked for those children who were in shared care-time arrangements. There is also evidence that encouraging the use of non-legal solutions, and particularly the expectation that most parents will attempt FDR, has meant that FDR is occurring in some cases where there are very significant concerns about violence and safety. A majority of lawyers and a large proportion of family relationship service professionals expressed the view that the system had some scope for improvement in achieving an effective response to family violence and child abuse. Some problems referred to were evident before the reforms, such as difficulties arising from a lack of understanding among professionals, including lawyers and decision-makers, about family violence and the way in which it affects children and parents. While the legislation sought to place more emphasis on the importance of identifying concerns about family violence and child abuse (e.g., SPR Act 2006 s60B(1)(b), 60CC(2)(b)) other aspects of the legislation were seen to contribute to a reticence among some lawyers and their clients about raising such concerns. These include SPR Act 2006 s117AB, which obligates courts to make a costs order against a party found to have "knowingly made a false allegation or statement" in proceedings and a requirement for courts to consider the extent to which a parent has facilitated the other parent's relationship with the child (s60CC(3)(c)). The link between safety concerns and poorer child wellbeing outcomes, especially where there was a shared care-time arrangement, underlines the need to make changes to practice models in the family relationship services and legal sectors. In particular, these sectors need to have a more explicit focus on effectively identifying families where concerns about child or parental safety need to inform decisions about care-time arrangements. These findings point to a need for professionals across the system to have greater levels of access to finely tuned assessment and screening mechanisms applied by highly trained and experienced professionals. Protocols for working constructively and effectively with state-based systems and services (such as child protection systems) also need further work. At the same time, the progress that continues to be made on improved screening practices will go only part of the way to assisting victims of violence and abuse. 7. To what extent are children's need and interests being taken into account when parenting arrangements are being made? This question is central to the objectives of the reforms and therefore a number of the evaluation questions are relevant to assessing the extent to which children's needs and interests are being taken into account. Particularly relevant is the question of the extent to which issues relating to family violence and child abuse are taken into account in making arrangements regarding parenting responsibility and care time. This is an area where the evaluation evidence points to some encouraging developments, but also highlights some difficulties. Many parents are using the relationship services available and there is evidence from both clients and relationship service professionals that this is resulting in arrangements that are more focused on the needs of children than in the past. Nonetheless, in a proportion of cases this is not occurring as well as it could. There is evidence that many parents misconstrue equal shared parental responsibility as allowing for "equal" shared care time. In cases in which equal or shared care time would be inappropriate, this can make it more difficult for relationship services professionals, lawyers and courts to encourage parents to focus on the best interests of the child (discussed further below). While the SPR Act 2006 introduced Division 12A of Part VII - Principles for conducting child related proceedings - which was supported by new case management practices in the FCoWA and the FCoA, the court that handles most children's matters, the FMC, did not have change its case management approach. 8. How are the reforms introduced by the SPR Act 2006 working in practice? The philosophy of shared parental responsibility is overwhelmingly supported by parents, legal system professionals and service professionals. However, many parents do not understand the distinction between shared parental responsibility and shared care time, or the rebuttable (or non-applicable) presumption of shared parental responsibility. A common misunderstanding is that shared parental responsibility allows for "equal" shared care time, and that if there is shared parental responsibility then a court will order shared care time. This misunderstanding is due, at least in part, to the way in which the link between equal shared parental responsibility and care time is expressed in the legislation. This confusion has resulted in disillusionment among some fathers who find that the law does not provide for 50-50 "custody". This sometimes can make it challenging to achieve child-focused arrangements in cases in which an equal or shared care-time arrangement is not practical or not appropriate. Legal sector professionals in particular indicated that in their view the legislative changes had promoted a focus on parents' rights rather than children's needs, obscuring to some extent the primacy of the best interests principle (s60CA). Further, they indicated that, in their view, the legislative framework did not adequately facilitate making arrangements that were developmentally appropriate for children. However, the changes have also encouraged more creativity in making arrangements, either by negotiation or litigation, that involve fathers in children's everyday routines, as well as special activities in arrangements made. Advice-giving practices consistent with the informal "80-20" rule have declined markedly since the reforms. Total court filings in children's matters have declined, and a pre-reform trend for filings to increase in the FMC with a corresponding decrease in the FCoA has gathered pace. Legal sector professionals had concerns arising from the parallel operation of the FMC and FCoA, including the application of inconsistent legal and procedural approaches and concerns about whether the right cases are being heard in the most appropriate forum. The FCoA, the FMC and the FCoWA have each adopted a different approach to the implementation of Division 12A of Part VII. The FMC processes have changed little (although this court is perceived to have an active case management approach pre-dating the reforms) and the FCoA and FCoWA have implemented models with some similarities, including limits on the filing of affidavits and roles for family consultants that are based on pre-trial family assessments and involvement throughout the proceedings where necessary. Excluding WA, the more child-focused process available in the FCoA is only applied to a small proportion of children's matters, with the majority of such cases being dealt with under the FMC's more traditional adversarial procedures. While family consultants and most judges believed the FCoA's model is an improvement, particularly in the area of child focus, lawyers' views were divided, with many expressing hesitancy in endorsing the changes. Concerns include a lack of resources in the FCoA leading to delays, more protracted and drawn-out processes, and inconsistencies in judicial approaches to case management. Similar concerns were evident to a lesser extent about the WA model. It appears that while these models have significant advantages, some fine-tuning is required. This is an area where this evaluation provides only a partial picture, as these issues were considered as part of a much larger set of evaluation questions. The new substantive parenting provisions introduced into Part VII of the FLA by the SPR Act 2006 tend to be seen by lawyers and judicial officers to be complex and cumbersome to apply in advice-giving and decision-making practice. Because of the complexity of key provisions, and the number of provisions that have to be considered or explained, judgment-writing and advice-giving have become more difficult and protracted. There is concern that legislation that should be comprehensible to its users - parents - has become more difficult to understand, even for some professionals. 9. Have the reforms had any unintended consequences - positive or negative? The majority of parents in shared care-time arrangements reported that the reforms worked well for them and for their children. But up to a fifth of separating parents had safety concerns that were linked to parenting arrangements; and shared care time in cases where there are safety concerns correlates with poorer outcomes for children. Similarly, the majority of parents who attempted FDR reported that it worked well. Most had sorted out their arrangements and most had not seen lawyers or used the court as their primary dispute resolution pathway. But many FDR clients had concerns about violence, abuse, safety, mental health or substance misuse. Some of these parents appeared to attempt FDR where the level of these concerns were such that they were unlikely to be able to represent their own needs or their children's needs adequately. It is also important to recognise that FDR can be appropriate in some circumstance in which violence has occurred. Further unintended consequences are also evident. A majority of lawyers perceived that the reforms have favoured fathers over mothers and parents over children. There was concern among a range of family law system professionals that mothers are disadvantaged in a number ways, including in relation to negotiations over property settlements. There is an indication that there may have been a reduction in the average property settlements allocated to mothers. Financial concerns, including child support liability and property settlement entitlements, were perceived by many lawyers and some family relationship professionals to influence the care-time arrangements some parents seek to negotiate. The extent to which these concerns are generally pertinent to separated parents is uncertain. The evaluation indicates a majority of parents are able to sort out their post-separation parenting arrangements quickly and expeditiously; however, there is also a proportion whose post-separation arrangements appear to be informed by a "bargaining" rather than "agreeing" dynamic. For these parents, it appears the reforms have contributed to a shift in the bargaining dynamics. This is an area where further research is required. The evaluation evidence indicates that the 2006 reforms to the family law system have had a positive impact in some areas and have had a less positive impact in others. Overall, there is more use of relationship services, a decline in filings in the courts in children's cases, and some evidence of a shift away from an automatic recourse to legal solutions in response to post-separation relationship difficulties. A significant proportion of separated parents are able to sort out their post-separation arrangements with minimal engagement with the formal system. There is also evidence that FDR is assisting parents to work out their parenting arrangements. A central point, however, is that many separated families are affected by issues such as family violence, safety concerns, mental health problems and substance misuse issues, and these families are the predominant users of the service and legal sectors. In relation to these families, resolution of post-separation disputes presents some complex issues for the family law system as whole, and the evaluation has identified ongoing challenges in this area. In particular, professional practices and understandings in relation to identifying matters where FDR should not be attempted require continuing development. This is an area where collaboration between relationship service professionals, family law system professionals and courts needs to be facilitated so that shared understandings about what types of matters are not suitable for FDR can be developed and so that other options can be better facilitated. consideration of whether (and if so how) information already gained via sometimes extensive screening procedures within the family relationship service sector can be used by judicial officers or by those providing court assessments to assist in the process of judicial determination. While communication in relation to privileged and confidential disclosures made in assessment and FDR processes raises some complex questions, investigation of how such communication could potentially occur may be an avenue for achieving greater coordination and ensuring expeditious handling of these matters. Currently, much relevant information may be collected by family relationship service professionals in screening and assessment processes, but this information is not transmissible between professionals in this sector and professionals in the legal sector, or between other agencies and services responsible for providing assistance. Effectively, families who move from one part of the system to the other often have to start all over again. For families already under stress as a result of family violence, safety concerns and other complex issues, this may delay resolution and compound disadvantages. Effective responses to families where complex issues exist entail ensuring they have access to appropriate services to not only resolve their parenting issues but also deal with the wider issues affecting the family. Such responses involve identifying such concerns and assisting such parents to use the dispute resolution mechanism that is most appropriate for their circumstances. Effective responses should ensure that the parenting arrangements put in place for children in families with complex issues are appropriate to the children's needs and do not put their short- or long-term wellbeing at risk. Further examination of the needs and trajectories of families who are unsuitable for FDR would assist in identifying what measures are required to assist these families (to some extent, LSSF W2 2009 may assist with this). A key question is the extent to which such families then access the legal/court system and whether there are barriers or impediments (e.g., financial or personal) to them doing so. The evidence of poorer wellbeing for children where there are safety concerns - across the range of parenting arrangements, but particularly acutely in shared care-time arrangements - highlights the importance of identifying families where safety concerns are pertinent and assisting them in making arrangements that promote the wellbeing of their children. This evaluation has highlighted the complex and varied issues faced by separating parents and their children and the diverse range of services required in order to ensure the best possible outcomes for children. Ultimately, while there are many perspectives within the family law system and, many conflicting needs, it is important to maintain the primacy of focusing on the best interests of children and protecting all family members from harm. Fehlberg, B., Behrens J., & Kaspiew R. (2008). Australian family law: The contemporary context . South Melbourne: Oxford University Press. Harrison, M. (2007). Finding a better way: A bold departure from the traditional common law approach to the conduct of legal proceedings. Canberra: Family Court of Australia. House of Representatives Standing Committee on Family and Community Affairs. (2003). Every picture tells a story: Report on the Inquiry into Child Custody Arrangements in the Event of Family Separation. Canberra: Commonwealth of Australia. McIntosh, J. (2009). Legislating for shared parenting: Exploring some underlying assumptions. Family Court Review, 47(3), 389-400. Winkworth, G., & McArthur, M. (2008). Framework for screening, assessment and referrals in Family Relationship Centres and the Family Relationship Advice Line. Canberra: Attorney-General's Department. Retrieved 26 November 2009, from <www.ag.gov.au/www/agd/rwpattach.nsf/VAP/(CFD7369FCAE9B8F32F341DBE097801FF)~Screening+and+Assessment+Framework+-+July+2008.PDF/$file/Screening+and+Assessment+Framework+-+July+2008.PDF>. 1 The Family Law Amendment (Shared Parental Responsibility) Act 2006 (Cth) (SPR Act 2006) amended the Family Law Act 1975 (Cth) (FLA 1975). As this report is oriented toward a broad audience rather than a specifically legal one, references to provisions introduced by the SPR Act will be preceded by SPR Act, for the sake of simplicity and clarity. Technically, of course, such provisions are FLA provisions. 2 Family Law Amendment (Shared Parental Responsibility) Bill 2005, Explanatory Memorandum, p. 1. 3 The committee conducted an extensive range of consultations and considered many submissions before publishing its report. 4 The evaluation also provides important benchmarks against which future developments can be assessed. 5 The full report is available from AIFS at <www.aifs.gov.au>. 6 For further details, see 2007 Evaluation Framework, reproduced in Appendex B. 7 Family relationship services are funded by the Australian Government via the Family Relationship Services Program (FRSP). 9 Western Australia has its own state court exercising family law jurisdiction, the FCoWA. There are two main courts exercising family law jurisdiction in the rest of Australia: the FCoA and the FMC. 10 While it is recognised that complex definitional issues are relevant in this area (see Fehlberg, Behrens, & Kaspiew, 2008, p. 185), the term “family violence” is used in the evaluation because it is the term used in the main relevant legislative and practice instruments (see FLA 1975 (Cth) s4; Winkworth & McArthur, 2008). 11 These estimates are based on data from the Longitudinal Study of Separated Families (LSSF W1 2008) of parents who had separated post-July 2006 and who were clients of the Child Support Agency (CSA), conducted as part of the evaluation. The questions in this survey were adapted from the ABS Personal Safety Survey 2005 measures. Parents were asked whether they had: (a) been physically hurt by the other parent prior to separation and, if so, whether the children had witnessed any abuse or violence; (b) been emotionally abused by the other parent before or during the separation, with options available for nominating different types of emotional abuse (including: (i) preventing the respondent from contacting family or friends, using the telephone or car, or having knowledge of, or access to, family money; (ii) insulting the respondent, with the intent to shame, belittle or humiliate; (iii) threatening to harm the child(ren), other family/friends, the respondent, pets or themselves; and (iv) damaging or destroying property); and (c) current safety concerns (for themselves or the child) as result of the child’s contact with the other parent. It should be noted that large-scale survey methods are generally not well suited to collecting reliable information about whether the acts reported were aggressive or defensive, or their subjective impact on the target. 12 With the exception of those working with Centrelink, from which FRAL draws its staff. 13 Data from the GPPS, conducted in 2006 and 2009. 14 Where parents in the LSSF W1 2008 had more than one child under 18 years old, care-time arrangements (and various other child-related matters such as their wellbeing) refer to only one of these children (called the “focus child”). The same approach was used in the LBS 2009. 15 Decisions examined relate to the child’s education, health care, religious and cultural ties and sporting and social activities. 16 Where the term “legal system professionals” is used in relation to data from the FLS 2008, 2009 or QSLSP 2008, it encompasses lawyers (solicitors and barristers), family consultants, registrars and judicial officers (Federal Magistrates, and FCoA and FCoWA judges). 17 House of Representatives Standing Committee on Family and Community Affairs, 2003, ¶ 2.13. 18 For example, the measure of “family violence” in the LSSF 2008 is based on respondents’ reports regarding whether or not their child’s other parent had abused them emotionally or hurt them physically. No attempt was made to identify whether respondents themselves had been perpetrators of such violence. 19 Data in this section comes from the GPPS 2006 and 2009, the Grandparents in Separated Families Study (GSFS) 2009, the Survey of FRSP Clients 2009, and the surveys of family relationship service providers. 20 Here, “post-reform separated parents” were parents who participated in the LSSF 2008, while “pre-reform separated parents” were those who participated in the LBS 2009. 21 Form 4 notices are used to notify courts where there are concerns about family violence and child abuse. 22 This was also acknowledged to be the case by some family consultants and judges. 23 “Round table dispute resolution” is one (though by no means the only) model that might be further explored by FDR practitioners and other professionals within the sector. The authors would like to acknowledge and thank all of those who participated in or assisted with the evaluation including: the Family Court of Australia, the Federal Magistrates Court, the Family Court of Western Australia, the Child Support Agency, family relationship service providers, Family Relationship Services Australia, Council on the Aging New South Wales, Mensline Australia and the Family Law Section of the Law Council of Australia. We also acknowledge the helpful assistance of staff from the Australian Government Attorney-General's Department and the Australian Government Department of Families, Housing, Community Services and Indigenous Affairs. We would particularly like to acknowledge the major contribution made by Associate Professor Bruce Smyth to the development of the Evaluation Framework and design of a number of the studies. We are also grateful to Professor Richard Chisholm who assisted in the development of the Evaluation Framework. Associate Professor Smyth and Professor Chisholm also made major contributions to the analysis of the Family Lawyers Survey 2006. Presents findings from Wave 3, conducted in 2012 with 9,028 parents five years after separation.